Norio Fujikawa Jetscooter | Definitive Touch - Men's Contemporary Style. 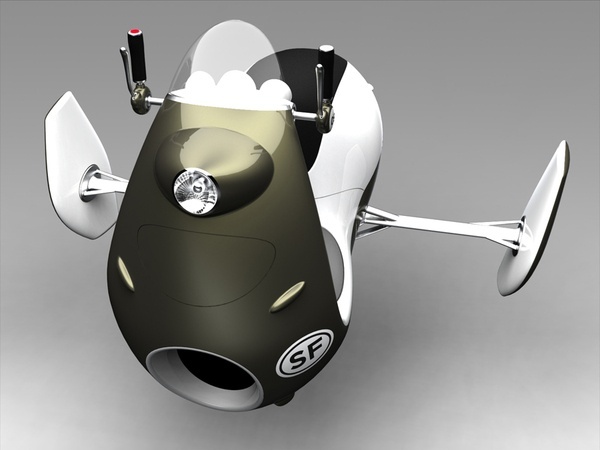 Illustrator and conceptual thinker Norio Fujikawa gets full-marks for this radical Jetscooter concept. Based in San Fransisco the designer has a penchant for futuristic ideas, with retro styling, and transport innovation that might become a reality in, say 2025. Until then we can only marvel and this creative genius. I really admire the more stylish race version he did. But this one really fits a average joe/jane segment making it seem more attainable as personal transportation. O.o its back heavy, if you were to trust from the back it would tip over. what the point of passing this off as product “design” if it would never work. its neat looking, but lets call it art, its not design, designs are functional. I like the red sport bike version better. Cool idea and an interesting interpretation of a futuristic scooter. Could be pushed even farther visually, still resembles a Honda 50cc bike of today- but with a rocket engine (that part is cool). I wish people would put half as much effort into figuring out how to make the anti-gravity work as they put into making pictures of what it would look like if it did.